Traveling for business purposes can often take up a lot of time and energy. It was very different from leisure travel as work travel can be time consuming and really drain your productivity. Luckily there are people who have done it for years. Whether you’re new to the “road warrior” lifestyle or you’re a veteran – here are some tips on how to survive as a road warrior. Create a packing system that works for you. After months of traveling, you’ll know exactly what you need and what you don’t need. Oftentimes, you won’t have much time to pack early in between work assignments, so creating a checklist is a great way to ensure that you have everything you need for your business trip. • Laptop, tablet, phone and their respective chargers. • Wrinkle free and iron free clothes. Trust us, this will save you time and help you look better. • Comfortable shoes that transition from work to casual wear easily. • Passport, ID and any visas. Pack light by ensuring that everything you need fits into a single carry-on. In case there is not enough time to check-in your luggage (most airlines require check in luggage at least 45 minutes or more prior to flight) or to prevent your luggage from getting lost while traveling abroad. Our rule for packing is to only bring one to two of everything. Three of anything is too much. It is worthwhile to sync your files and documents up to “the cloud”. This will ensure your most important documents are readily accessible anytime and anywhere. We recommend using Google Drive or Dropbox. Both services are free until you reach their paid account limits. Jetlag can be a huge waste of time. If you are crossing multiple time zones you will have to combat jetlag. An easy way to adjust to new time zones is to switch time zones the day before or on the day of of your travel. This may mean that you have to stay up longer or go to bed earlier, but it will help you adjust more efficiently once you are at your destination. Power naps are also a great way to combat jetlag. A 20-30 minute nap can make a big difference on how you feel while traveling long distances. Get a good pair of earplugs and eye masks that block out all light to help you sleep comfortably while on the road. Before you head out, make sure you have figured out how you will have Internet access. Book hotels that offer free or discounted Wi-Fi. Having internet will make your trip a lot more comfortable. Don’t rely on spotty Wi-Fi networks. For domestic trips, use your data plan as a hotspot or purchase a Wi-Fi dongle with a plan that offers internet access wherever you go. Just because you’re traveling, doesn’t mean it’s time to slack off on your normal routine. Treat transit time as normal working hours. Stay productive while on the plane. Get internet access so that you can get your work done and catch up on assignments while in transit on a plane. Also make an effort to stick to your exercise schedule and eating plans. If you’re on a particular diet, research beforehand what restaurants and grocery stores in the area support your diet. Planning ahead will make it a lot easier to stick to your habits. Figure out if there is a gym at or near your hotel. I have ClassPass which allows me to workout at participating gyms and studios throughout the US. This way I do not skip on my workouts and maintain my healthy lifestyle. 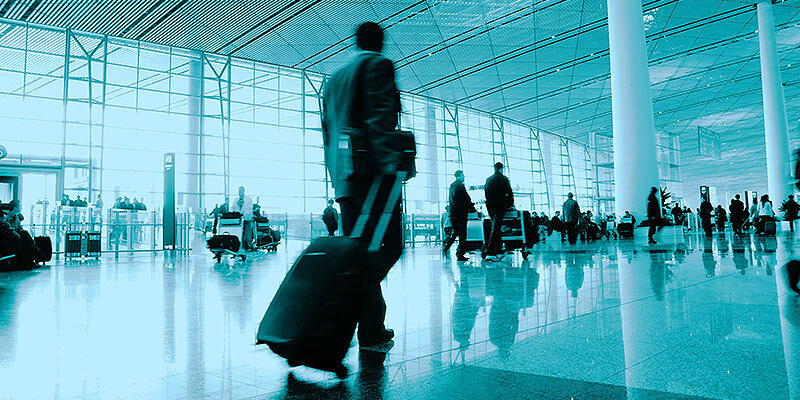 If you live and travel in the USA, get Global Entry or TSA Precheck to get you moving along the airport security lines faster. This will save you at least 15 minutes going through security lines and save you the hassle of taking your shoes off or removing electronics and liquids from your carry-on bag. Some premium credit cards, such as Chase Sapphire Reserve and American Express Platinum, will also offer TSA Precheck and Global Entry with your membership. Or at least try not to get sick. Don’t indulge in habits that will cause a hangover the next day or get you sick on the plane or while on land. Bring along hand sanitizer and eat healthy meals to prevent yourself from getting sick. If you’re visiting a dry place, book a humidifier beforehand to keep your sinuses wet. I know it sounds gross, but it will aid in preventing illness. We recommend using TripIt or Deem Work Fource to consolidate all your travel information and plans whether they’re for business or pleasure. TripIt manages your trip details and has all your trip itinerary numbers in one place, that way your hotel, rental car, and flight information are all together. There is even an option to forward your trip confirmations and itineraries to TripIt from your email so that it will automatically populate the details of your trip into your account. Deem Work Fource allows you to book, manage your entire itinerary, and consolidate expenses in one mobile app. Choose one favorite hotel and airline and stick to it. Earn status on your chosen rewards accounts so that you can get free upgrades and other perks that make work traveling worth it. Oftentimes, certain airlines and hotels will offer partner perks as well. When redeeming miles, try to save them up for international destinations. When using your points/miles, try to stack them on top of current airline and hotel deals so that you use less of your accumulated points. If there is a fare sale, it may be a good idea to book a ticket using your points and credit card benefits (ie. Chase Sapphire Rewards offers 1.5 times the redemption when booking within their travel portal). For example, I regularly book paid tickets on Alaska Airlines flights when there’s a deal, saving me points and at times, 30% or more off the already discounted price. Duluth Travel can help you organize and set-up all your corporate and leisure travel needs. Connect with one of our consultants right now to inquire about our plans and packages.